When Mary Rosser and her husband, Todd, moved back to her hometown of Salisbury after 20 years away, they were simultaneously delighted and dismayed to see so many people riding bicycles around town. As avid recreational cyclists, they were thrilled to meet kindred spirits who shared their passion. But they also saw many people riding poorly maintained bicycles as a primary mode of transportation, without wearing helmets or following proper rules of the road. The Rossers discussed their observations with fellow cyclists on a Sunday afternoon social ride and learned that they all shared the same vision for a non-profit organization that would teach bicycle repair, maintenance and safety, and allow people in the community to earn their own bikes by participating and volunteering. “It was kind of an ‘ah-ha’ moment for all of us,” Rosser said of the group, which also included Sharon Earnhardt, Rhonda and David Harrison, and Karissa Minn. They got to work, secured several grants and non-profit status, and The Pedal Factory was born. Two years and hundreds of bikes later, downtown Salisbury has a unique working collaborative where anyone can have access to tools, parts, advice and a sense of community. The cooperative work space at 311 E. Council St. is filled with rows of donated bikes in every shape and size, helmets for those who don’t have one, and boxes and bins organized with spare tires, chains, pumps, and tools. The atmosphere is welcoming, with colorful, large-scale murals by local graffiti artist Shane Pierce covering the walls. 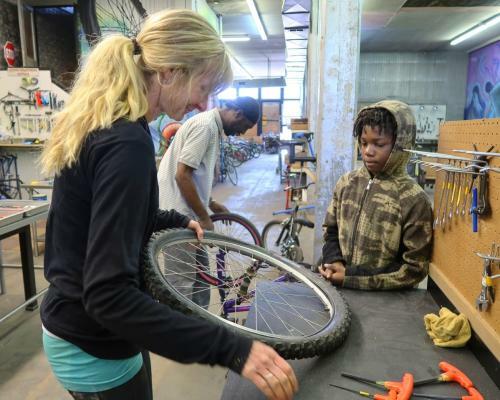 The Pedal Factory also plans events and outreach initiatives designed to make bicycles accessible to children and adults who need them. From bike rodeos and camps to organized rides, the events help raise awareness and educate the public about bicycle maintenance, safety and community responsibility. Community partners have ranged from the local sheriff’s department to public schools. Additional cycling events are being coordinated for the summer with community partners including Salisbury Parks and Recreation and the Salisbury-Rowan Runners.